I had a problem. 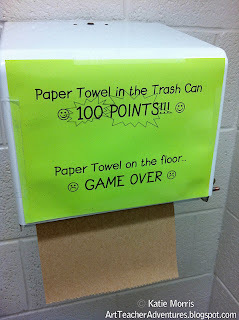 In my classroom bathroom (my room used to be a preschool classroom), I would find tons of paper towel trash all over the floor whenever students washed their hands after a messy project. I tried just remind them to get their paper towel in the trash can and telling them we shouldn't make our awesome custodians' jobs harder and none of it worked. One day I was thinking about Emotionally Intelligent Signage like I've seen on Daniel Pink's blog. I came up with an idea that is not exactly emotionally intelligent but catches the students' attention with something they can relate to. 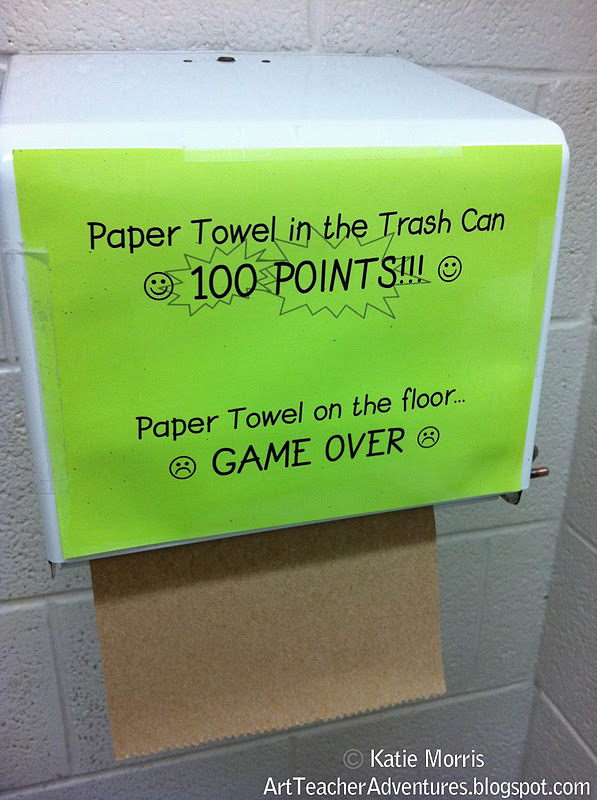 Paper Towel in the Trash Can 100 POINTS!!! I think next year I am going to go to rags. I am just tired of seeing all the paper towels we use every day. I mean, what I could clean with one paper towel, takes one of my students 24 paper towels. Crazy! We use cloth rags for wiping tables and other surfaces in the classroom (elementary). They work much much more efficiently! I often can use one rag to wipe down six tables very quickly. Old tee shirts work well for drying tables and counters. I tell students if they take more than 2 paper towels they will have to do push up and that helps a lot...lol.